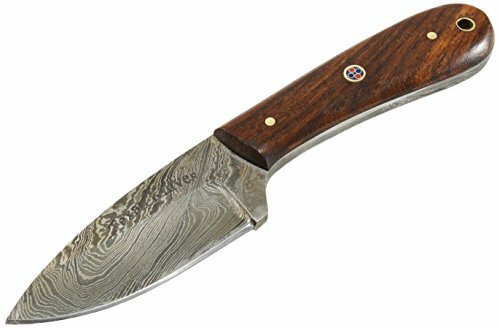 Short Skinner, Indian rose wood handle with scabbard Damascus skinning knife. 416 layers, Rockwell hardness of 60 . 1095 high carbon tool steel with combination of 4340 Nickle. Texan knives is based out of Houston, Tx. Specialized in Damascus knives. Also able to accommodate custom orders for knives and swords. If you have any questions about this product by Texan Knives, contact us by completing and submitting the form below. If you are looking for a specif part number, please include it with your message.